SALE! $450 for the pair, originally $595 for the pair. 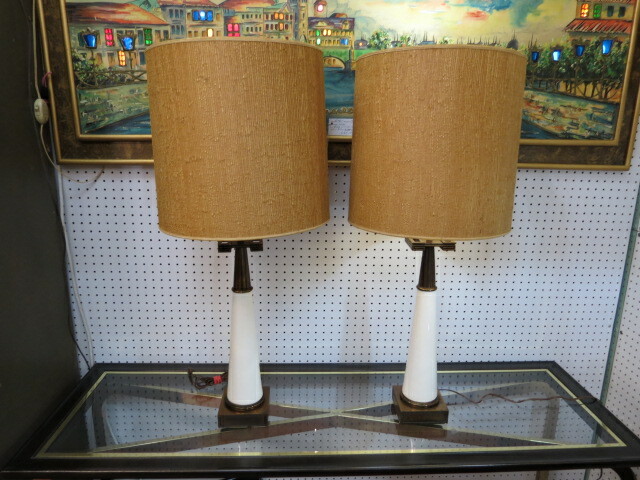 Vintage mid century modern pair of Stiffle lamps and shades, c. 1960. Dark brass square base with round tapered white porcelain center, topped with drak brass greek key design. Beige grass cloth drum shades. Perfect for your mid century modern living room. Excellent condition. Base measures 5in square, shade measures 15in wide, 15in tall. Entire lamp with shade is 36in tall.